Like the cobbler’s children who have no shoes, we have had no decent quilt on our bed. Until now. I loved it so much, I decided to make it big enough for our bed. I tried to imitate some of the borders that were done in the round robin. This quilt ended up to be 124″ long and 128″ wide. I had to put it on Steve’s machine to quilt it, because I only have a 12 foot table, he has a 14 foot table on his machine. And since it was so big, I did not do custom quilting. The pantograph on it is called Wandering Daisies. I hear ya sister. I don’t have a (made by me) quilt on our bed either and it’s high time I changed that! I plan to by next year for sure. Your quilt is lovely. So now I know you painted your room to match your new quilt..GOOD PLANNING! Newsflash: I did not paint the room to match the quilt. But others have thought that too. I painted the room that color because we both like that color. We got gray carpet because we thought it would go ok with the paint and would be neutral enough for the rest of our lives and to go with other colors. 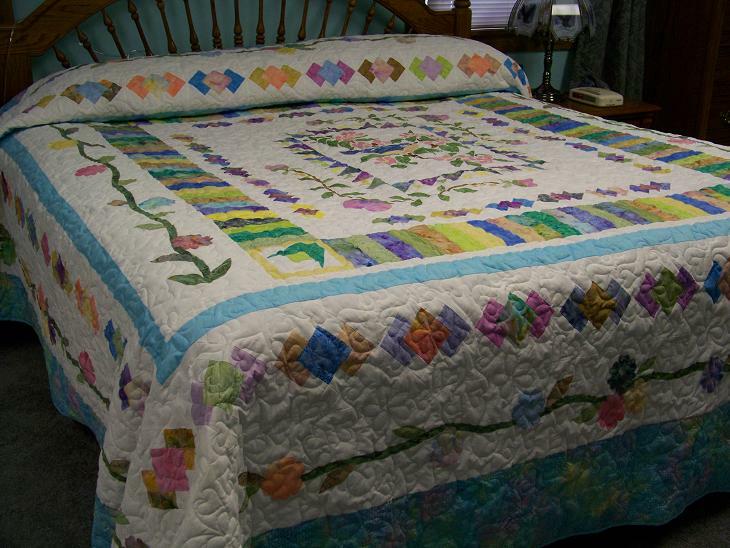 I did the quilt when I got my round robin back because it just looked good in that room and decided then. I really didnt plan it that way. The quilt is gorgeous Gayle. I have a quilt on our bed that I made in 1998. Maybe I need to make a new one. Oh, it’s beautiful! 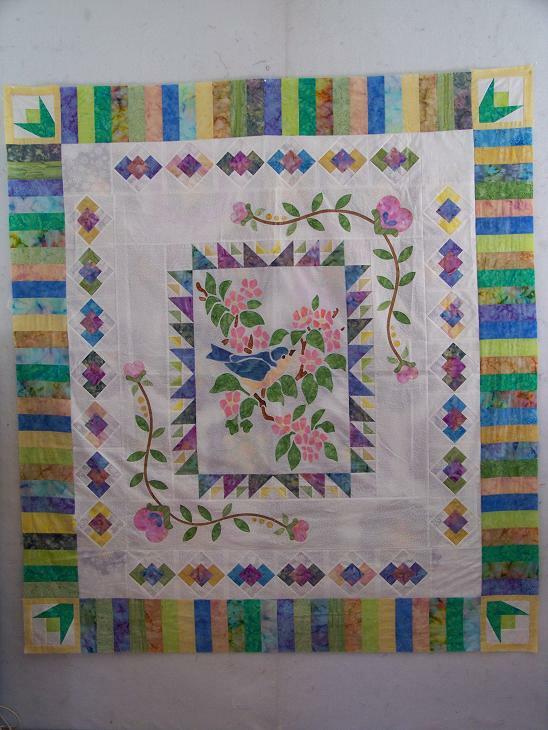 I LOVE the colors AND the piecing and applique! IT”S GORGEOUS! That is a beautiful quilt. How nice for you to have it on your bed to enjoy. 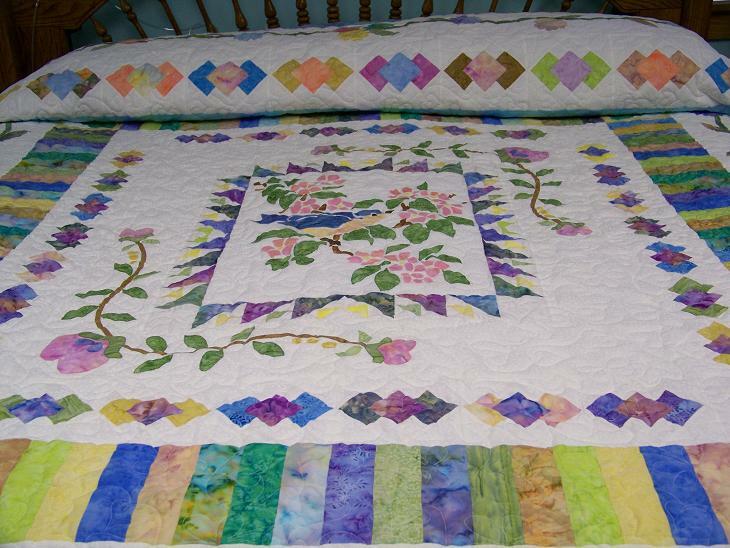 Beautiful quilt – and it sure is big! Beautiful! I love every section of it. It is so unique. I love your new bedroom, too! The color is perfect. The drapes seem to combine the wall color and the carpet color. 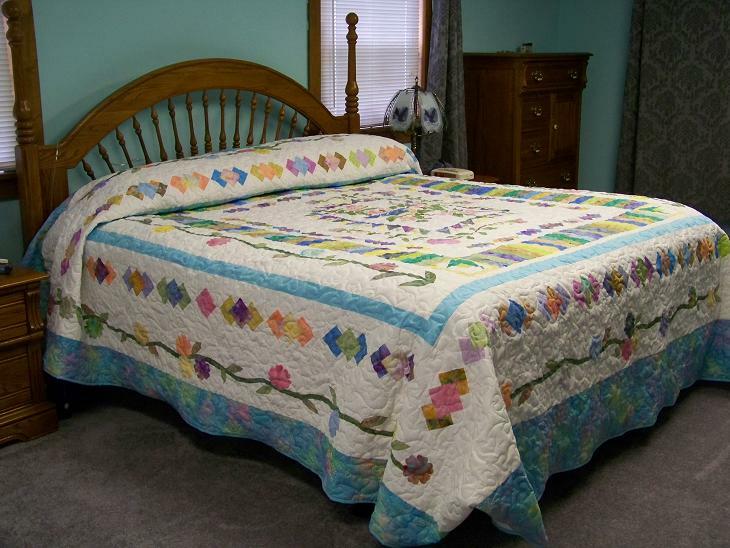 But that gorgeous quilt is certainly the focal point. I thought I was the last person on earth to use the cobbler’s children phrase. But it is sad but true that most quilters don’t have a quilt on their own bed. At least in me experience. Your round robin gone around again is wonderful. You should be very proud. Love the quilt, and glad to see your post. Hope you are doing well. hey Gayle….that quilt looks spectacular in your room. just the right thing. i love round robin quilts…they usually come back as a pleasant surprise. that one sure did. glad to see your post….i check every day to see what’s going on with you. i miss your regular postings. stay cool…stay well….stay happy. It’s beautiful! I was just thinking of yo yesterday, It’s time for Chris to go pick blackberries and raspberries. He’s going to the place near where your son lives.